Please refer to our stock # 7924 when inquiring. Impeccable condition French Jet long earrings that make a bold statement for daytime or evening wear. French Jet is shiny black glass that was hand carved, polished to a high shine and backed in metal and set into elegant jewelry that was fashionable during Victorian times. It was acceptable as mourning jewelry, but was worn for many occasions. The contrast between the black of the jewelry against pale skin was considered a mark of beauty. 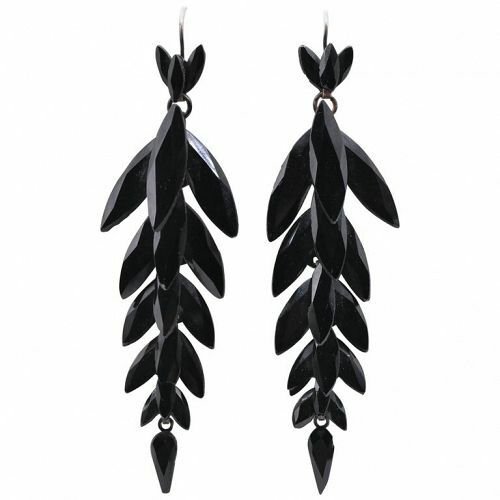 The leaf form of the earring is a classic form that looks as good today as it did in Victorian times.